I wanted to first thank Kat for such a wonderful blog, it is such an inspiration to me. Thank you for letting me be a part of it while you are away. Okay a little about myself, where do I start. I am Pamela and you can find me on Created to mother. I am a Christian Christ following wife and mother of one wonderful husband and 7 daughters. We are a home schooling family traveling down a road not traveled very much by most. I thank the Lord each day for allowing me to school our girls even though it can be tuff at times. The greatest challenge that I have had to face came before I was a Christian. This challenge lead me to the Lord in the end, and all I can say is AMEN! I started suffering from a lot of anxiety in my eary 20's and I only had 1 little girl at the time. The death of my uncle hit me very hard. I am not sure why it hit me so hard the day I heard the news. I was not very close to him but he was always very kind to me when I was with him. He was my dad's only brother and I knew he would be upset. Thinking I was going to have a heart attack at any moment, I started to have anxiety attacks about 1 week after I heard the news. My uncle died from a heart attack, and never made it to the hospital. Day after day I could not be alone I had to be with someone all the time. I went to the ER about 5 times in just a few months. Things were not good and I needed help. took my scars and pains from me. After becoming a follower of Jesus Christ, I changed all kinds of things and I did like a 360 in my life. God opened my heart to home schooling and changed my views on children; I now wanted to leave it in his hands. I feel him working in my life every day and he never leaves me when I fall. What a blessing. I have grown in my walk with Christ and learn new things every day. I pray that in hard times, us as Christians don't lose sight of the Bible and God's love. Blessings to all of you. 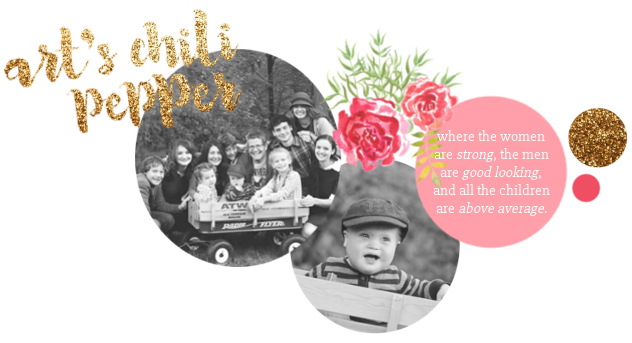 I am so grateful to you for taking the time to guest post at Art's Chili Pepper. Your story is a beautiful example of how the great physician loves to bring healing and peace to those whom He has created and how giving Him control of our lives can often bring healing in many different areas. Thank you for being willing to put your heart on the line to reach other ladies who don't have the peace only Jesus can give. Too many people rely on medicine to fix their symptoms instead of looking for what only God can provide- healing.